These express courses are great value for money at €29 a head, and they don’t take you off the beach during the day as they start at 6PM. Julie, Susana and I attended the recent Chicken Jalfrezi course there which was a sell out. Antonio greeted us with his usual warm welcome and some spicy Indian tea and explained the background to the dish. Jalfrezi is a curry you can cook very quickly, almost like Chinese wok cookery, and he told us we could vary the spiciness according to our own taste. The ingredients are all pre-prepared at Cook in Lanzarote, so there’s no chopping to do, and even better, no washing up! Before we started, Antonio explained everything we would be doing, and then we fired up the gas and we were off and running, with him regularly checking up to make sure we had everything under control. I was surprised that there were only three base spices used, and several of us added extra chilli, and some of us extra ginger. As always with cookery, the quality of the ingredients is an important factor. All of the vegetables and most of the spices we used were from Cook in Lanzarote’s own garden, and the chicken stock was pre-prepared for us by Antonio, and was a rich jelly-like stock. We also used Garam Masala from a recipe made on their longer curry course, and the smell when that went in was amazing! One of the best parts of cooking there is that you all get to sit down together and enjoy the fruits of your labour. Antonio dished up bowls of Basmati rice and served glasses of local wine while we spooned out our curries. I was amazed – I cook curry often, but this was the closest I’ve ever been able to get to that authentic “curry restaurant” Jalfrezi, and I thoroughly enjoyed my meal. For those who couldn’t manage it all (I could!) there were take away boxes provided. It’s a cracking couple of hours, and you get the recipe afterwards so you can wow friends next time you have a dinner party. 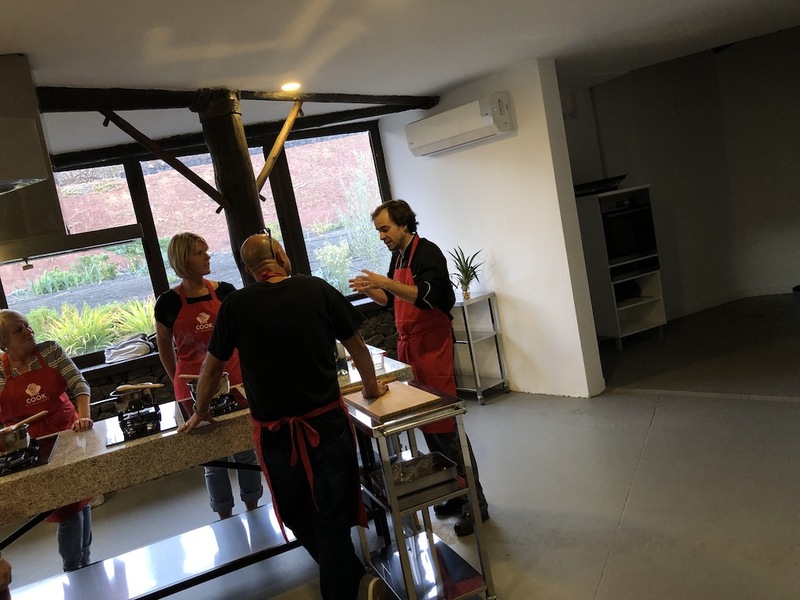 You can find out much more about Cook In Lanzarote and book onto any of their courses at their website: Cook in Lanzarote.